On Monday, March 26, 2018, the Co-President of the Stavros Niarchos Foundation, Mr. Andreas Dracopoulos, was awarded with the Grand Cross of the Order of Honor of the Hellenic Republic, in a ceremony that was held at the Presidential Mansion. The Grand Cross medal was conferred by H.E. 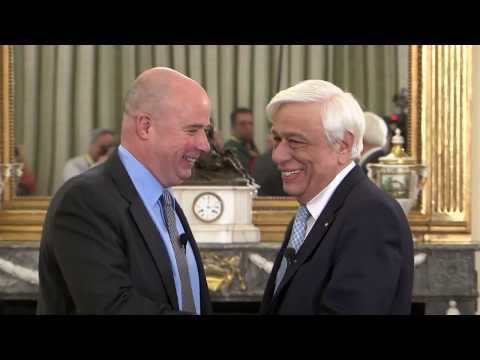 the President of the Hellenic Republic, Mr. Prokopios Pavlopoulos, as an expression of recognition for Mr. Dracopoulos’ work and contribution to the country. The Grand Cross of the Order of Honor constitutes one of the highest distinctions of the Greek State and is awarded to citizens for their contribution to society and the public good, as well as their contributions to enhancing Greece’s stature worldwide. In 2016, Mr. Dracopoulos had received the Rank of the Officer of the Legion of Honor of the Republic of France, while in 2012, he was also awarded the Greek State’s Grand Commander of the Order of the Phoenix. The President of the Hellenic Republic, Mr. Prokopios Pavlopoulos stated "The Stavros Niarchos Foundation, under your leadership, continues through its significant contribution, the tradition of National Benefactors. However, it does not simply continue the tradition, but, as a result of the size of its grants, it surpasses it, opens up new horizons, and sets an example for many others to follow. I want to emphasize, that the example of the Stavros Niarchos Foundation reminds us that it was the contributions of National Benefactors that have been linked with crucial moments in the history of the modern Greek State. Such a critical moment is the one we are currently undergoing. That is why your decoration with this honor is absolutely justified. It does not only give the Stavros Niarchos Foundation and you personally what you deserve, but it is an example that I wish and I hope others will follow. Because rest assured, Mr. Dracopoulos, our country is capable of doing so much more. It owes this much to its inheritance but also to the prospects of the Greek people, especially the younger generation. We congratulate you and thank you warmly." Ask not what your country can do for you—ask what you can do for your country. Even though these words were first spoken by a great American, John F. Kennedy, I would like to borrow them, because I believe that today—more than ever—we all need to be guided by them. From my late great- uncle, Stavros Niarchos, who built everything that today enables us to help bring about positive, lasting changes to society through the Foundation bearing his name, to the largest or smallest grant we have ever made as a charitable foundation, we have always been guided by the aim of strengthening Hellenism and the values that it represents—in their purest and most romantic form. It is “philotimo,” bravery, generosity, openness, hospitality, the strong and immortal spirit, perseverance, temperament, family ties, the earth, the sun, the light and the sea, which determine our DNA; “nostos,” the ability of being born again and again from our ashes and to rebuild our homes, our villages and our country from scratch. These values accompany Hellenism throughout the ages, wherever it may be, and wherever it comes from. These are the elements, which we choose to highlight and reward through the grants of the Stavros Niarchos Foundation. These are the values, which we ourselves wish to follow and to represent through our work and the work of our many distinguished collaborators. Each of our grantees has been, and always remains, primarily our partner. The honor bestowed upon me today, is really a reward for all of us; for my great uncle and our Founder, Stavros Niarchos, for all my colleagues at the Foundation, but also for all of our grantees-partners, my family, my friends who have stood by me in life, during both good and bad times. It is an honor that I will always carry deep in my soul, and which I bequeath to my children as a true reminder, because, nothing is more important than our love for our homeland, as defined by each of us. Our homeland is our own place, our home, our family and our friends. Our homeland is the land that embraces us, encourages us to create, to contribute, to give back to it. Our homeland is our World. The Stavros Niarchos Foundation was born in Greece 22 years ago, after the passing of our Founder. From the very beginning, the Foundation spread its wings to the rest of the world, having made grants to 124 countries to date. It is an international philanthropic organization, but its spirit will always be Greek. We are very proud to have gifted this country a landmark project such as the Stavros Niarchos Foundation Cultural Center, and to have contributed, to the best of our capabilities, to addressing the effects of the crisis that has been plaguing the country for the last few years. Your excellency, I wish to thank you personally. I would like to share the supreme honor, which you have bestowed on me today, with all those who, through faith, perseverance and self-denial, transcend themselves in order to lend a helping hand to their neighbor, to raise awareness, to energize, to motivate, to inspire.